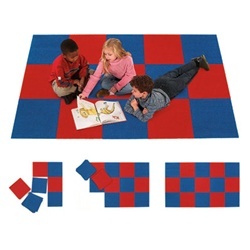 Flagship introduces durable carpet squares made from Americolors". The squares are 18" x 18" and with a vinyl backing for long lasting quality. The squares come with a lifetime wear warranty. Sold in boxes of 20 squares: Royal Blue and Rowdy Red or get a mix of 10 each for an additional charge. Each box covers 5 square yards or an area of 5'x9'.